While we have had by no means the hottest weather in the country these past few weeks, it's been mighty hot here. And while I still want to cook, I just don't feel like it. So I make grand plans, but when it comes time to execute them I often end up waffling. A few weeks ago my friend gave me a bag with some CSA items she wasn't going to be able to use before leaving on her vacation. I thought it was just going to be a few zucchini, but I also ended up with a bunch of white beets, a small head of cabbage, a radish (!) and 2 small kohlrabi. All lovely, but what was I going to do with it? Several years ago, not long after I first started this blog, a friend suggested that I tackle the subject of how to plan meals, especially for beginning cooks. She said she knew how to follow a recipe, but she wanted to do a better job of looking at ingredients (either in her kitchen or at the store) and coming up with a meal plan that would utilize them. At the time, I was really just starting to figure out how to do that myself, so I did not know how to put into words what I was just beginning to get a feel for myself. But the thought stayed in my mind and informed many of the posts I wrote, and it did start a project that lasted for a few months, that might just be worth reviving. It was interesting to see what items I had to purchase for my cooking, and what I already had on hand. I think I might have to start that up again. Zucchini - Of the three, one went into frittatas and the other two I used as pizza topping. Beets, kohlrabi and radish - I boiled the beets, then sliced them with the kohlrabi and the radish and made a salad with red onion, fresh oregano, and a lovely honey mustard vinaigrette. If I had any greens I would have added them as well, but I made do with what I had. Cabbage - Ah, the cabbage. I had big plans for that cabbage but just couldn't get to the point of actually going into the kitchen and starting any of those dishes. By the time it needed to be used, I also had two small eggplants that were getting a little past their prime. I also have a large amount of dried chana dal right now, so I decided to make soup. The picture above is a little fuzzy, but the soup was quite good. I combined a few techniques I had picked up from other recipes, most notably Madhur Jaffrey's recipe for Spicy Eggplant Stew with Potatoes, Mushrooms and Chickpeas, but it seemed more effortless to just start chopping the vegetables and throw them in the pot than it is when I am following a recipe. It wasn't perfect this first time around, but it was pretty close, and with just a few tweaks it will be excellent. I love the toasty nuttiness of the chana dal, but regular chickpeas would work just as well, or any legume for that matter. And any vegetables would work instead of cabbage and eggplant - you can use whatever you have on hand. So this is a dish that, if you have the basics down, you can make any time with any vegetables. I also happened to have some chickpea stock in the freezer so I used that, but you could use vegetable or chicken stock, or even water if that's all you have. The best advice I can think of to give someone who has just started cooking and wants to go further than just following recipes is this: Consider recipes as suggestions, and start looking at specific ingredients as recommendations. If you have some vegetables in your refrigerator that you need to use and you don't have any specific recipes for them, think of some dishes that you do like and imagine how they would taste with what you have. I think you will be surprised at how quickly you learn how easy it is to start creating your own dishes. But recipes are still necessary, at least to me, if for nothing else than the "suggestion" of how to use something in a way I might not have thought of myself. 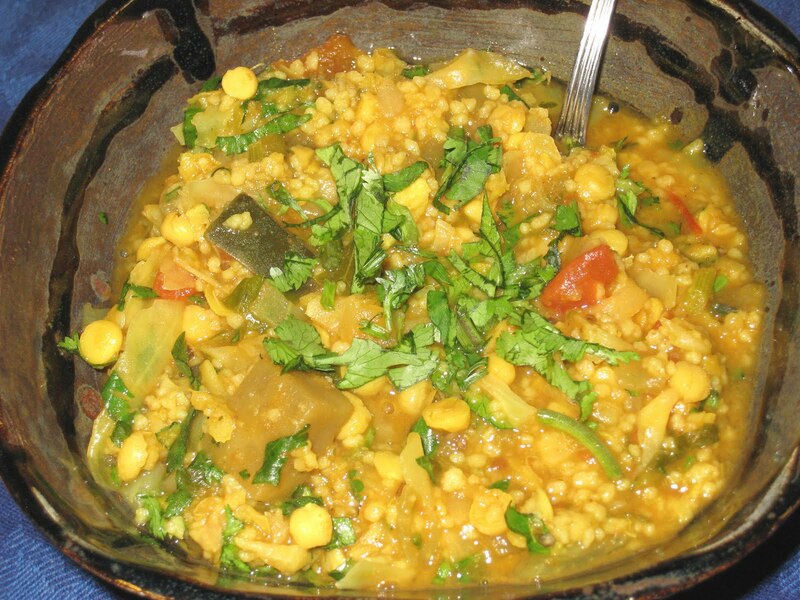 And so I give you the recipe for my Chana Dal with Cabbage and Eggplant. 1 cup diced tomatoes, with liquid. Heat oil in a large pot. Add the onions and cook until just translucent. Add the garlic, ginger and serrano pepper and cook another 2 minutes. Add eggplant and half a teaspoon of salt and cook for about ten minutes. Add cumin, turmeric and masala and cook for 1 minute more, being careful not to burn the spices. Add the cabbage and cook for a few minutes, until it has started to wilt. Add the tomatoes, the stock, and salt to taste. Bring to a boil and then lower the heat. Simmer for about 20 minutes, until the eggplant is tender. Add the chana dal (or chickpeas) and the couscous and continue to cook until the chickpeas are heated through and the couscous have cooked. Remove from the heat and add the cilantro and the parsley before serving.